What is UP, my dudes. It's been a while. I've been making quite a bit of progress on my game, but it's always small things and I never think it's worthwhile making a blog post about. However, now I have a handful of small things, so maybe it's time to make an update. I'll even include pictures, because otherwise WHAT'S THE POINT. The USB ports on my computer all stopped working a month or so ago, which meant I couldn't use my tablet, so I wasn't able to make any snazzy new maps (which has basically hindered all gameplay/story-related progress, because I need to map the next lot of towns and dungeons). 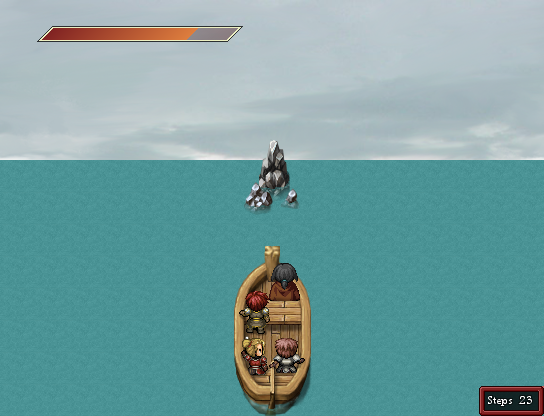 I decided to plot out some puzzles instead, one of which being a boat-riding minigame where you dodge the rocks coming towards you as you ride back to shore. The mechanics are all pretty much finalised, as well as most of the graphics in the screenshot above, except for the background. Don't worry about the little 'steps' window in the corner—that's just for debugging purposes and doesn't show up in the real game. I made that boat solely with a mouse, so I'm pretty stoked about that. Needs a wee bit of a touch up, because the post at the front is still fuzzy, but I'm happy about it. It should also technically be a sailboat, but a. sails are hard to draw, and b. if there's a sail in the way, you can't see the cute wee characters. I'm sure people can suspend disbelief enough. If not, well, I'm sure they won't like that people can do magic because of special pieces of rock either. For those that are interested, the mechanics are fully scripted (rather than evented in the editor). It could probably do with a bit of an overhaul, because I can see ways to improve the code (even only a month later), but for now it works fine. Weapons and shards and gems, oh my! 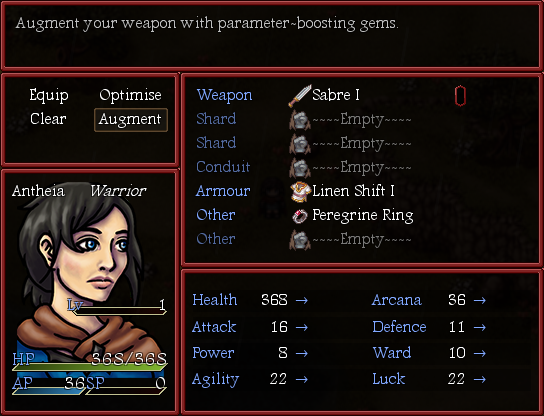 Upgrading your weapon was part of the original demo of Vermilion, but upgrades were (and still are) linear—you progress from Sabre I to Sabre V, and the stats change respectively. I wanted to include a way for people to 'buff' their weapons without creating separate paths for the weapon to travel down (although that may be something I look into in the future). Enter GEMS (name still TBC). 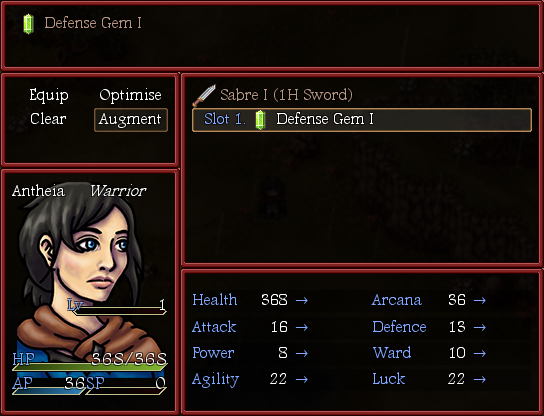 The player will find various 'gems' along their travels that they can slot into their weapon to add a stat boost. 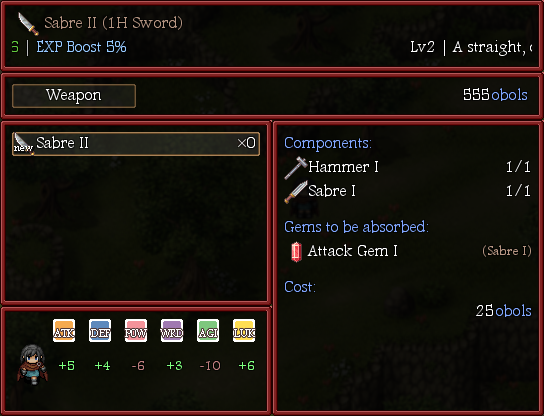 As the player upgrades their weapon, they will gain more slots (for example, Sabre III has two slots) and the equipped gems will be absorbed and become part of the weapon's stats. You can see what that looks like in the crafting scene above. Now that I look at this screenshot again, there are a couple of tweaks I need to make to the crafting scene, but you get the idea. And yes, as I was saying before, the name 'gems' is still to be confirmed, because I'm worried that players will get them confused with the Shards (which you equip to gain elemental magic). Another idea I'm leaning towards is just plain ol' descriptive enhancements, e.g. 'Honed Edge' for attack boost, but they aren't so good visually (it's easy to show an empty slot, for example, with gems). The latest thing I've been working on is a functioning controls menu. Originally, I just had a window that showed what the controls were, which was fine and did what it said on the tin, and then I started overthinking things (as usual) and realised that if one changed the in game controls via the default F1 menu (which comes with the RGSS player, the programme that plays VXAce games), then the in game controls would show the wrong input. For example, if I changed it so that the 'Input A' button was now the C key rather than the Shift key, it would still say 'Shift' in game. I found a script that could read what the player had set in the F1 menu (which is stored in an external dll), except that it would throw an error if the player had never opened the F1 menu and confirmed the controls (in any VXAce game). SO, I then dug around and found a lovely input script by GaryCXJk that gives you the tools to change the inputs to any keyboard key, and I used that to build the controls menu. 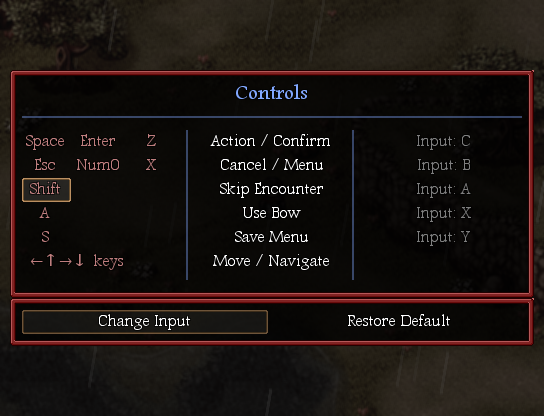 The player can change the keys to any key from selection of keys, and the same key can't be used for multiple buttons. You can set up to three keys for each button. You can also restore the keys to the default settings as well. JUST LIKE A BOUGHT ONE. Anywho, that's pretty much all the interesting stuff I've been working on, and it's taken me about a week just to write this blog post. I should probably do regular updates on my main game page as well, but I never know whether to just copy over the posts from here, or if I should write a whole 'nother blog. And, as you know, I struggle to update one as it is.